The boot/trail runner argument will likely go on forever. 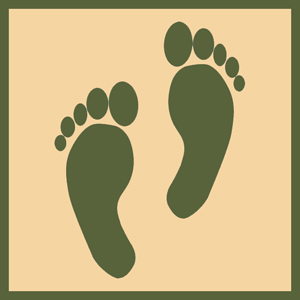 What everyone agrees on is this: it is even more important to take care of what you wrap that footwear around: your feet! Here are ten best practices to keep you blister – and injury – free for the entire thru-hike of the John Muir Trail. 3. Wick sweat away from your feet. A fresh pair of high quality socks (no cotton) each day will help keep your feet dry. I carry two pair so that I can slip a relatively clean set on each morning, after laundering them and drying them on the top of my backpack. Some folks have great success with wearing two pairs: a thin inner sock and a thick outer one. 6. When you take a break get off your feet! Even better, raise them higher than your rear end for a few minutes. A well broken in pair of boots helps too! I always remember going on a long hike in scouts with my brand new boots. I had so many hot spots after the first few miles, it felt like there were coals burning in each boot. Very true, Scott. Thanks for the comment! I’m a big proponent for using heat-moldable insoles in place of the removable insoles that come with boots. If you size up to accommodate these insoles (plus inevitable foot swelling after a few weeks of hiking) then your feet and other parts of your body will thank you. I’m with the trail runner crowd with regard to waterproof boots though: I don’t use them for anything more than an overnighter. First, they will eventually get wet, despite your gaiters and rain pants, after which they can take days to fully dry out. Second, my feet sweat a lot more in waterproof boots, which raises the heat and humidity you need to avoid on your feet. Of course, YMMV! Thanks for the comment. I have never used the “heat moldable” inserts, but I am a huge fan of Superfeet. Can’t agree with the inevitability of water inside waterproof boots, though. Mine have always stayed dry. My boy scout troop uses Leukotape-p to pretape and also to treat blisters. We also require new hikers to use thin liner socks with thick outer socks. The liner sock tends to bond lightly with the Leukotape and create a slip surface between the two socks. If your feet are clean when first applied, Leukotape will last 2 to 4 weeks, enduring swimming, showers, and 20+ miles /day. Moleskin lasts longer with Leukotape reinforcement. When using trail runners, I tend to roll my ankles. Leukotape stopped that. Leukotape is a mainstay of distance runners and is very highly regarded by many of them. Thanks for the suggestion, Rudy. Great info that I have shared with my hiking buddies. We are hiking the High Sierra loop in a couple of weeks. Wanted to share that a good pedicure is important. I always carry a pair of clippers for that pesty sharp nail that can really cause some irritation. Take good care, happy hiking! Great tip, Diane, and one I should have mentioned. One thing nice about the Sierra Nevada: after that long climb there is usually a nice descent! Too long nails can be a killer, when walking downhill. Good luck on the hike and thanks!